This day (March 29th) exactly one year ago we sent out our first issue to 21 recipients. Since we got our Tesla, I started avidly reading everything about Tesla. I started frequenting TMC, Reddit, following Elon and a few other interesting people on Twitter. The more that I read, the more engaged I was, suddenly I was putting an average of 7 hours a week to stay informed, I found the product and, more importantly, the community fascinating! Content is key. We build the newsletter around exciting content, not the most relevant ‘news’ but all kind of material, information about batteries, software, internals, etc. With these basic principles we went off, I posted on TMC (here is our first post ever talking about Tesletter) on March 27th, and on March 29th, we sent our first issue to 21 people! I forgot to mention this all happened a few days right before our second daughter was born on April 1st. 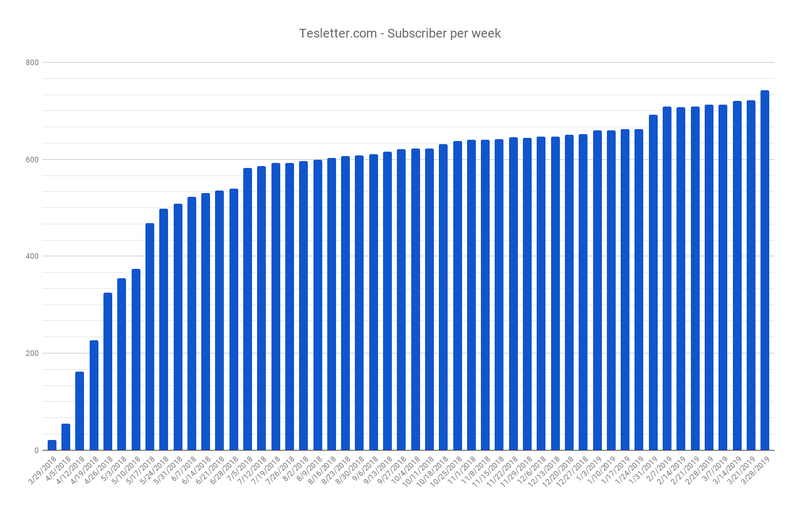 We arrived home from the hospital on April 2nd and while really sleep deprived, we sent out the second issue of the Tesletter on April 5th to 54 subscribers (holy smokes Batman we more than double while at the hospital!). For an entire year, we’ve only skipped sending the Tesletter out once, while we were on vacation in Dubai - we spotted a few Teslas there too. The first issue had an astounding 76.2% open rate and 38.1% click through, but that isn’t hard with low numbers, as the subscribers grew we have stabilized into 61.4% open rate and 22% click through including an average of two clicks per each user who clicks through. Since we were having a kid days after we thought about starting the Tesletter we probably should have waited to start it after Layla was born. Growing the number of users is not going to happen on its own. This is probably true for most products but even more so in the case of Tesletter since we always link out to 3rd party sites and even our most engaged subscribers - understandably - share the original source with others. Something that I’ve observed this last year and that I want to call out is that Tesla is fantastic, not only because their product is excellent but because their user base is the best. I’ve seen people offering others their home to charge their car, I’ve seen people leave no stone unturned so fellow owners can make their last wishes come true, or help another one that got their entire catalog of Tesla products copied and listed on Amazon. Honestly, these people are amazing! We want to thank you for being a subscriber and the entire Tesla community for being so awesome! What is next for Tesletter? We plan on doing what we do best, selecting the best Tesla related content and sharing it weekly with our subscribers. We intend to continue to be truthful to our principles, only talk about Tesla’s products (cars, software, batteries, solar, etc.) but don’t include stock related news nor talk about Elon’s - or anyone else’s - personal matters. We might try to grow our subscriber base a bit faster, may be reaching out to Tesla Owners groups to see if they think what we do is worthwhile and want to help, maybe trying writing more proprietary content ourselves, or in other ways. If you want to help us just spread the word, tweet about us, tell your local Tesla Owners group, or do whatever you think can help us, we would be thankful!